Major New Year and Christmas events in Kyiv will be staged on Sofiyska and Mykhailivska Squares, according to mayoral resolution No. 1156 posted on the town hall's official website. This document supports proposals put forth by NGO Initiatives of the Capital for the organization of New Year celebration and the project entitled "The Country's Main Xmas Tree. New Year and Xmas Events in Kyiv" on Sofiyska Square, Mykhailivska Square, and along Volodymyrsky Thoroughfare December 17, 2016, through January 15, 2017. The assembly of facilities, structures and equipment needed for the events on the two squares started on November 21. The municipal transport department will amend trolleybus and bus routes and schedules correspondingly to the agenda of the events on such days as December 19 (from 16:00 to 20:00 Kyiv time), on December 31 (from 20:00 to 02:00 the next day), on January 1 (from 14:00 to 20:00), and on January 7 (from 11:00 to 14:00). What is more, Kyiv's funicular (cable railroad) will work non-stop at night from December 31 to January 1. The municipal authorities asked the National Police and the police's patrol department to partly limit traffic (except for public transport) on Sofiyska and Mykhailivska Squares from December 5 to January 23. They also ask to halt all types of transport on December 19 (from 16:00 to 20:00 local time), on December 31 (from 20:00 to 02:00 the next day), on January 1 (from 14:00 to 20:00), and on January 7 (from 11:00 to 14:00). The installation of small wooden cabins of the so-called Xmas Village has already begun on Sofiyska Square, the organizer of New Year events near St. Sophia Cathedral and St. Michael Cathedral has said. Read alsoUkrainian children's Christmas wish: Let the war end and father return homeThe City of Entertainment on Mykhailivska Square is scheduled to open on December 15 together with the opening of a New Year and Xmas fair along Volodymyrsky Thoroughfare. 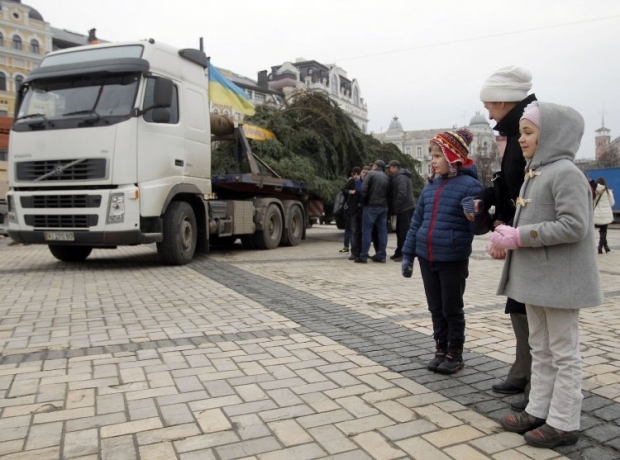 The official ceremony of the launch of the country's Xmas Tree will take place on December 19. Events to welcome the new year 2017 will be held on December 31. An Orthodox Xmas Decoration Didukh (a Sheaf of Wheat) show with a Christmas carol festival (Velyka Koliada) is scheduled to be held on January 7.